Russian Deputy Prime Minister Dmitry Rogozin and Cuban Vice President of the Council of Ministers Ricardo Cabrisas Ruiz have signed a program of technological cooperation between the two countries in the sphere of defense. The signing took place at the conclusion of a meeting of the Russian-Cuban commission on trade, economic, scientific and technological cooperation in the capital Havana on Thursday.The program will span several years and will last until 2020. Russian Deputy Prime Minister Dmitry Rogozin told journalists after the signing that the program does not stipulate deliveries. “Since Russia has long ago arrived at the program-target method in defense issues, we have our own methodology, experts knowing how to ensure short-term and near-term planning. This kind of assistance will be provided. So, this is more of a methodological assistance, which will help shape the long-term capacity planning program aimed at the modernization of armed forces. This will not be supplies, but precisely this kind of methodological assistance,” Rogozin explained. He added that a lot of the technology that Cuba has was supplied by the Soviet Union and that currently Russia is working on creating maintenance bases and providing services to help Cuba ensure its own security. The move comes as US President Barack Obama has attempted to revive ties with the island nation, however President-elect Donald Trump could limit the thawing of tensions that have persisted for decades. In May 2016, President Obama visited Cuba, breaking an 88-year drought of US presidents visiting Havana. PRETORIA, September 13. /TASS/. The Russian Federal Service for Military-Technical Cooperation (FSVTS) has for the first time proposes South Africa to engage in joint industrial research in the defense sphere. “South Africa has a major industrial potential while Russia can offer a lot in the sphere of defense, security and law enforcement. We proposed long-term hi-tech cooperation,” FSVTS Deputy Director Anatoly Punchuk told Tass on Tuesday after the first bilateral seminar held on the eve of the biggest Africa Aerospace & Defense (AAD-2016) show. The seminar was attended by over a hundred experts from both countries who discussed organizational and legal aspects of military-technical cooperation between Russia and South Africa, business specifics in each country, copyright protection and other issues. “We discussed what to begin with, i.e. various models of industrial cooperation, including financial aspects. We have high-tech platforms which can be integrated with existing South African systems or maybe even with future jointly created new technologies,” Punchuk said. 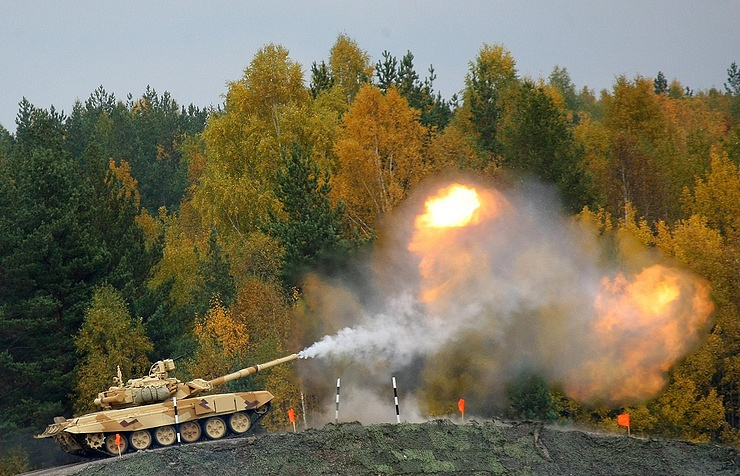 Russian exerts at the seminar stressed that technological platforms of the T-72 tank have not been surpassed and that in aircraft, air and missile defense technologies Russia “is in the first line”. South African experts demonstrated big interest in Russian helicopters, coast guard ships and armor. Secretary of Defense Sam Gulube said his team was “enthusiastic and interested” in industrial cooperation with Russia but stressed no contracts could be expected overnight. “As leaders we have to give a start to the process so that our people deal with specific issues. It is like marriage. When you meet a beautiful girl at a party you do not marry her the next day but ask her telephone number. This is a networking seminar that will yield result with time,” he said. The seminar was followed by a meeting of the joint intergovernmental commission on military-technical cooperation. On the sidelines of AAD-2016 Punchuk is scheduled to meet South African Defense Minister Nosiviwe Mapisa-Nqakula. “Iran and Russia have the needed capacities to broaden their mutual cooperation in the defense field,” Madani said as quoted by the Fars news agencyThe meeting was held after the opening ceremony of the 2016 Army Games. “Iran’s Armed Forces have good relations with Russia. We are sure the competitions will strengthen them more… The competitions are held at a very high level. We are grateful to Russia for holding these very significant competitions. We are looking forward to winning them,” Madani added. Russia is currently hosting the International Army Games on Saturday. The Games feature the competitions in 23 disciplines. A total of 121 teams from 19 countries across the world participate in the Games monitored by observers from 11 countries. Russian Deputy Defense Minister said that a fresh meeting of the Russian-Chinese intergovernmental commission on military-technical cooperation will be held in the near future. A fresh meeting of the Russian-Chinese intergovernmental commission on military-technical cooperation will be held in the near future, Russian Deputy Defense Minister Anatoly Antonov said Thursday. “Regular contacts between the heads of our defense ministries are of special importance in our relations. We are planning to hold a fresh meeting of the Russian-Chinese intergovernmental commission on military-technical cooperation soon,” Antonov said. Antonov said the Russian-Chinese military-technical cooperation is not aimed against third countries, stressing that the main common enemy is global terrorism. Parties discussed issues of bilateral military and technical cooperation, topical problems of the international and regional security, exchanged assessments of conditions and prospects of military and technical cooperation between two countries. Both sides confirmed necessity to continue taking coordinated efforts in the interests of strengthening the international security. Vladimir Kozhin, a presidential aide responsible for military and technical cooperation said that Russia expects military contracts with Iran to be worth “billions,” as Tehran is “highly interested” in buying Russian military equipment. Russia expects military contracts with Iran to be worth “billions,” as Tehran is “highly interested” in buying Russian military equipment, Vladimir Kozhin, a presidential aide responsible for military and technical cooperation, told the Izvestia newspaper. “The interest of the Iranian side is very high. They are really in need of a serious update for almost all of its forces… Given that this is a large country with large armed forces, of course, it will be very large contracts, worth billions,” Kozhin said, as quoted by the newspaper. Iran has already renewed S-300 anti-aircraft missile system deliveries from Russia. On November 9, Russia signed a new contract to supply Iran with the systems by the end of the year for the first time since the 2010 freeze on supplies under the 1929 UN Security Council resolution. Russia’s S-300 deal became possible again after Iran reached an agreement on its nuclear program with the P5+1 group of international mediators on July 14. Iran agreed to ensure the peaceful nature of its nuclear program in exchange for easing of the sanctions imposed against the country.